A family of five disappeared on a tech-free road-trip only to turn up one by one after a week-long odyssey of more than 1,600km (995 miles), which ended with a police investigation and two of them in psychiatric care. This was a missing person mystery that held Australia spellbound, writes Trevor Marshallsea. The Tromp family were by all accounts a normal, hard-working household. Mark Tromp, 51, and wife Jacoba, 53, had established a successful redcurrant farm and earth-moving business at their property in Silvan, on the outskirts of the Victorian capital, Melbourne. But with little warning, on Monday 29 August they and their three adult children - Riana, 29, Mitchell, 25, and Ella 22 - got into a car and headed north. They didn't just leave their family farm, they had fled. Police, later called to the home to investigate, found passports, credit cards and mobile phones had been left behind. This was to be a cash-only, "off the grid" road trip, with no way of being followed. It was later revealed Mark and Jacoba had been suffering increasing signs of stress and paranoia. According to media reports, at least one of them had become convinced someone was out to kill them, and take their money. The only phone not left behind belonged to Mitchell. He appeared to be the only one in the family not swept up in the belief that they were in danger. He later said he had gone along to ensure they would all be safe, but that his parents became increasingly delusional and hard to tolerate. Some 30km away from home, they made him throw his phone out of the car window. They were apparently convinced it was being used to track them. The family drove, in Ella's silver Peugeot SUV, through that first day and night until reaching the New South Wales town of Bathurst, 800km away, to the west of Sydney. It was there at 07:00 on Tuesday that Mitchell left the family. Later on Tuesday morning, the remaining four Tromps headed east from Bathurst to a popular tourist spot, the Jenolan Caves. It was there that Riana and Ella decided to also part from their parents. They did this by stealing a car. The two sisters drove south to the town of Goulburn, where they reported their parents had gone missing. The story made its way into the media and a bemused Australian public wondered how a family could have become so strangely separated, and separately lost, on what was at first thought to have been a driving holiday - and in their own country. This was not remote territory, not the vast Australian outback. At all times they were close to large towns. In Goulburn, Riana and Ella decided to part ways at a petrol station, with Ella saying she wanted to go home to feed her horses. She became the first Tromp to be located when she arrived back at the family farm on Tuesday night and found police there. Mitchell would arrive home the following morning, having taken a series of trains. While Mitchell and Ella appeared reasonably unaffected mentally, the same could not be said of Riana. She had climbed into the back of a utility vehicle in Goulburn, and was only discovered there by the male driver after he had driven almost an hour away. He pulled over and found Riana to be in what he called a catatonic state, saying she did not know her name, nor where she was. 1. Silvan - family leave home on Monday 29 August. 2. At Warburton, 30km down the road, Mitchell throws out his mobile. 3. Bathurst - Mitchell leaves the family on Tuesday 30 August. 4. Riana and Ella leave their parents at Jenolan Caves, steal a car and drive to Goulburn. 5. Wangaratta - suspected sighting of Mark on Wednesday 31 August. 6. Yass - Jacoba Tromp found wandering streets, Thursday 1 September. 7. Wangaratta - Mark Tromp found near airport on Saturday 3 September. Riana was later taken to Goulburn hospital, where she remains in psychiatric care. Police say she has been spared charges over the stolen vehicle for mental health reasons. Ella, however, has been charged with car theft. As media interest grew, and an interstate search began, Mark and Jacoba drove back toward Melbourne from the Jenolan Caves. A day later on Wednesday, 600km south in the Victorian town of Wangaratta, they too became separated. Jacoba headed north again, by means which are still a mystery, and was found the next day 350km away in Yass, wandering in an agitated state. She was taken to a hospital there, and later moved to Goulburn to be with daughter Riana, as the pair continued mental health treatment. Mark had stayed in Wangaratta. After dangerously tailgating a young couple, he was seen fleeing from Ella's Peugeot. Police also began investigating a number of break-ins in the town, including at a motel, though it's unclear if they were related. Image caption Mitchell and Ella have said their parents were "fearing for their lives"
Back at Silvan, Mitchell and Ella made an emotional appearance before the media, saying they were baffled by their parents' "paranoid" behaviour. "I've never seen anyone like this or anyone conduct themselves in this way. I just really want my dad to be found," Mitchell said. "He's not dangerous, he's my mate, my father. I love him." The last piece of the unusual puzzle was put into place on Saturday evening, six days after the episode began, when Mark Tromp was found beside a road near Wangaratta airport. He was questioned by police, assessed by a mental health officer, then released into the care of his police officer brother - showing the middle finger to photographers as he was driven away. He later released a more contrite statement, apologising for "the hurt and concern caused by these events". He paid respect to the community resources devoted to his family's aid, as the public attempted to make sense of the drama. Police do not believe there was any real threat to the family. One investigating police officer from the Silvan district described it as "the most bizarre case I've seen in 30 years". Sgt Mark Knight, who knows the family, said they had no diagnosed mental health problems. There was no evidence of drug-taking, as some social media theories had suggested, the family had no debts and did not belong to any religious groups. "This is just a massive meltdown, I'm sure of it," Sgt Knight said. Mitchell and Ella Tromp admitted it was hard to explain. 'I've never seen anything like it. It's really hard to explain or put a word on it but they were just fearing for their lives and then they decided to flee," Mitchell said. "It was a build-up of different, normal, everyday events - just pressure - and it slowly got worse as the days went by." 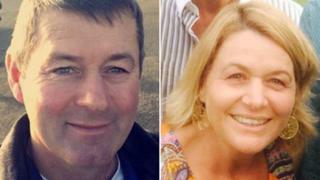 While some ponder whether the family may have been affected by chemicals used on their farm, media reports say police are also contemplating whether the family suffered from collective delusions, in an episode of "folie a deux". The French term, meaning "madness of two", covers a rare psychological condition occurring almost exclusively in close-knit families. It was originally coined to describe a 19th Century French couple who began exhibiting paranoid and delusional behaviour. While doctors were unable to tell which of them had become psychotic first, it was clear they had fallen into a cycle of reinforcing each other's delusions. The full reasons for the Tromps' very public meltdown might never be known, however. Police say no further charges are expected to be laid, and that the issue is now simply a family affair.